SEVERAL messages emerge from the analysis of crash programmes to harvest rainwater in Gujarat and ap. It is amply clear that the government of Gujarat has been much more successful in addressing the need of the hour than the AP government. POLITICIANS' RESPONSE: The way the political establishment has gone about social mobilisation in Gujarat needs to be commended. The state government recognised the failures of its past programmes and learned from the examples set by the civil society. It did not let the controversy over Sardar Sarovar Project get in the way of people's wellbeing. In AP, however, despite the thrust from the chief minister, the programme has got caught up in the corruption of petty politics. The government needs to listen to its critics and learn from the positive examples of civil society groups. DECENTRALISED APPROACH: The Gujarat programme succeeded because the government let the people decide their response to drought. When common people are allowed to have a say in governance, they cease to be victims and become stakeholders. The tank desiltation programme in ap has suffered in its initial stages due to indifference of the masses. This undermines the sustainability of decentralised water management, making drought more sustainable. As India's problems lie more with the government than with its people, the first step to any improvement is a government's recognition of its mistakes. CORRUPTION: While this plague of India's governance system is difficult to uproot -- even the successful SPPWCP in Gujarat has suffered -- a decentralised approach to development brings about greater transparency and accountability to the system. Again, the civil society's influence helps limit this problem, checking the deadly engineer-contractor nexus. PLANNING: This seminal aspect of any development effort is still not receiving the due attention. The best of intentions simply crumble under the absence of foresight. That the AP government did not spend enough time planning is obvious. But, experts say, Gujarat could have achieved a lot more if a little more care had been put into planning of government activities, especially monitoring of ongoing work. 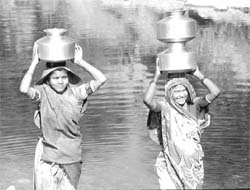 URBAN-RURAL CONFLICT: In Rajkot district of Gujarat, there have been voices of discontent among urban populations about the issue of checkdams stopping water from reaching reservoirs that feed urban populations. This is a major problem for the future, and requires immediate intervention to prevent incidents of rioting and deaths over water rights. To this end, promoting water harvesting in urban areas can be a great solution. The government of Gujarat would show great leadership if it were to promote water harvesting in all walks of life. If urban people can manage their own water, there would be no reason for conflict. The AP government deserves to be commended for taking up the issue in the state capital Hyderabad. But the implementation of the programme leaves much to be desired. CRASH PROGRAMME MENTALITY: This will be a major threat to all that has been achieved. If the Gujarat government treats SPPWCP as a temporay measure to deal with drought, it would not only worsen the water crisis but will also show the best available strategy to deal with it in a poor light. the lead taken by Gujarat has to emerge as an example to the rest of the country, especially its neighbour Rajasthan, where the government has done little beyond the traditional crisis-mongering to deal with drought. Gujarat has championed industrialisation in the country. It is time it shows that its achivements are not merely economic in nature. That it can do what governments in India have consistently ignored: real development lies in sound environmental governance. For AP, which features as an 'also-ran' in this report, it would be a good idea to send some ministers and bureaucrats to Gujarat for training. Gujarat is not very far from AP. And the example of Gujarat is also not very far from replication.